The whole building is equipped with smart, energy-efficient LED lighting whose standard luminosity setting is relatively low. The smart building combines low energy consumption with excellent operability that allows every employee to set the LED lighting to his or her preference. 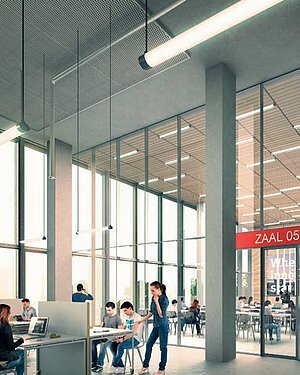 Using presence detection and daylight-dependent fittings, each light fitting can, in principle, be individually adjusted and the environment optimally aligned to the needs of the user.